>> My previous post was more of a summary of what the reporting of the "NASA arsenic-thriving bacteria" story looked like from my perspective in the wake of the massive Internet onslaught of information. In this post I want to talk about how the style of communication that drove this story has lead to the dissemination of falsehoods or misconceptions that hinder a proper understanding of biology in general, regardless of the validity of the actual findings. Last week I concluded that this was an interesting story with many significant possibilities, but that doubts had been raised about the validity of the findings and the scope of the conclusions that could be drawn. Already yesterday the backlash was a fact. Carl Zimmer has called up experts in the field, as well as two of the authors of the Science paper, and summarizes the aftermath in a Slate article published earlier today: "Scientists see fatal flaws in the NASA study of arsenic-based life". None of the scientists I spoke to ruled out the possibility that such weird bacteria might exist. <...> But almost to a person, they felt that the NASA team had failed to take some basic precautions to avoid misleading results. Much of it centers around the review posted by Rosemary Redfield of the University of British Columbia which very clearly and methodically exposes the shortcomings of the experiments from a microbiology point of view: "Arsenic-associated bacteria (NASA's claims)". She was by no means the only one who raised serious questions soon after NASA's press conference and the publication of the scientific article in Science: Read "Arsenate-based DNA: a big idea with big holes" and "Ordinary evidence would do". The main contentions that have been raised have to do with the controls used in the experiment, the methods of detection of arsenate in DNA and other molecules, and about whether or not the researchers managed to lower the amount of phosphate enough to actually "force" the bacteria to thrive on arsenate instead. I also concluded that this kind of aftermath is "science as usual", not something to get particularly worked up about, but that the style of communication that drove the story just doesn't allow for this process to come through. We get a mismatch between the communication of science, which affects people's expectations of science, and the actual scientific work method. This story couldn't have been better adapted for fast and enthusiastic dissemination through blogs, Twitter feeds and YouTube channels, but science isn't quite adapted to the internet... yet, and a very interesting conflict arises. A few bloggers have focused on this as well: "Extraordinary claims attract extraordinary blogging" at Byte Size Biology and "Is That Arsenic-Loving Bug — Formerly an Alien — a Dog?" at Wired. Some of the words used to describe the findings have been grandiose to say the least. Most reports claimed that these arsenic-thriving bacteria represented some sort of "new life form". NASA claimed that "the fundamental knowledge about what comprises all known life on Earth" has changed, that "the definition of life has just expanded" and that it "will alter biology textbooks and expand the scope of the search for life beyond Earth". Even the competing journal Nature writes in a news report that this finding "is posed to overturn scientists' understanding of the biochemistry of living organisms", even though they also allow for the doubts to be voiced. Among all this hype, it's difficult to separate the actual bigger picture from the falsehoods. GFAJ-1 doesn't represent a "new life form"
The bacterial strain GFAJ-1 could in itself be called a "new" life form, then again so could any species that's never been described before. The word "new" is more misleading than informative. In this case "new life form" is taken to mean either a species that represents a new and unknown group of bacteria, or a whole different form of life altogether; an organism completely unrelated to anything else we know, part of the so-called "shadow biosphere". 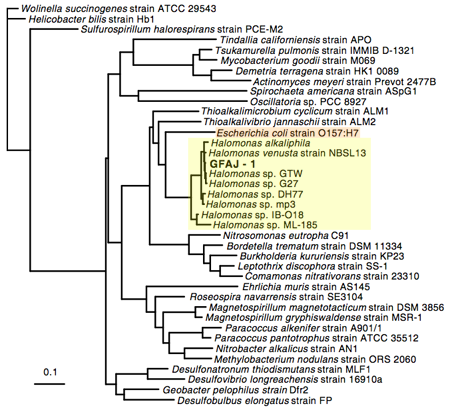 The authors of the Science study have refuted these possibilities themselves: To identify the type of bacteria they had isolated, they compared the gene sequences from ribosomal subunit genes between GFAJ-1 and many other species of bacteria, and arrive at the conclusion that the arsenic-thriving strain is related to the known genus of salt-loving bacteria Halomonas. The evolutionary tree below is a visualization of the analysis and shows GFAJ-1 within the yellow-marked Halomonas group. In orange you can also see, to take the point further, that good ole E. coli is a close relative. Ref: Adapted from Wolfe-Simon et. al. (see reference below). The fact that this comparison of very old and very conserved genes across many bacterial species could even be done highlights the fact that GFAJ-1 does not represent a whole "other" ancestral form of life. They have ribosomes of the same origin as most other life forms on Earth. Philosophically, if it turned out that an organism could use arsenate in place of phosphate, this would not in my opinion rewrite the rules of life as we know it; aside from the hydrolysis issue, arsenate is chemically very similar to phosphate. A careful chemist could likely synthesize DNA oligomers with an arsenate backbone. As I understand it this is precisely why arsenate is a poison. Ultimately, the idea of a shadow biosphere is interesting, but it would have to be demonstrated to be truly distinct from extant biochemistry, e.g. truly novel metabolic pathways, different bases for coding, different amino-acids or better still enzymes that were not based on amino-acids at all. >> Update 8 December. There's a great summary at SEED as well: "Death for 'Arsenic-Based Life'?" In the process they've also gone and made me a "Dutch neuroscience student", see the link in the gray box.